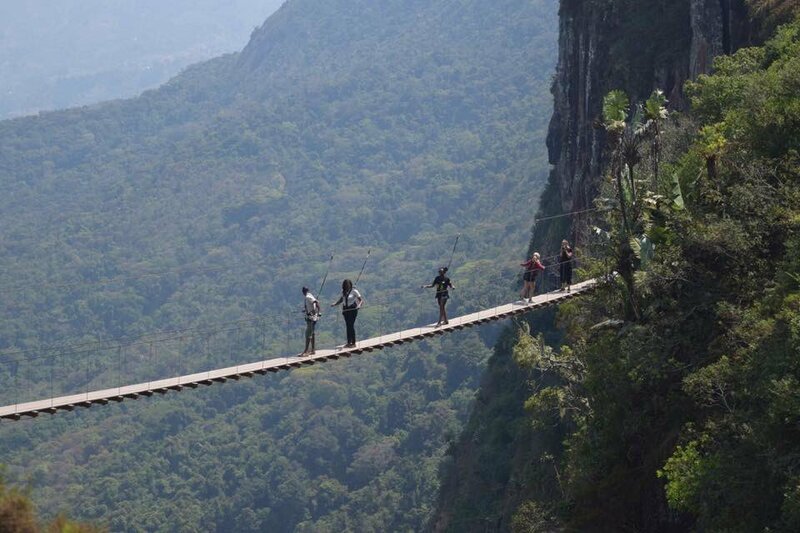 FAR and Wide — owners of the top-notch tourist destination, SkyWalk and SkyLine in Nyanga — could be forced to close shop after they were asked to pay $750 000 fine for allegedly evading taxes in nine years, The Manica Post has learnt. A letter of complaint authored by Mr Chris Craig, son to Far and Wide director Mr Bernie Craig addressed to the President’s Office, confirms that Far and Wide will have no choice but to close the business if the $750 000 penalty stands. “As far as we are concerned we are a fully registered Educational Facility compliant with all laws of Zimbabwe. ZIMRA subsequently refused to accept these certificates for a number of reasons suggesting that they were not valid and are now raising an invoice for VAT plus penalties on Far and Wide Educational income of $2 500 000 for the last 9 years which is 15% VAT and 100% penalty on this figure — a sum close to $750 000. If this invoice is raised against Far and Wide we will have to close the business with all of its implications,” reads a letter by Mr Chris Crag. The SkyWalk is a tourism destination with two 30-metre and 90-metre suspension bridges that are designed to look like vines above the falls allowing a full mid-air view of the Mutarazi Falls and its surroundings while the SkyLine is one of the zip line in the world where one can fly through clouds or crystal clear skies over the second highest waterfall in Africa. The letter by Mr Chris Craig outlines Far and Wide operations well before the establishment of the SkyWalk and SkyLine facilities. “1) Letter from Nyanga National Parks authorising us as an Educational facility. 2) Our land (Lot 16 Pamushana) is registered with Nyanga Rural District council as an Education facility. 3) We were under audit by ZIMRA for the year 2013 for over two years in which time they disallowed some of our expenses which incurred a fee of $7 000 which we paid. We then appealed for amnesty on the extra 100% penalty which we were granted. We believed that this would be it but they then asked why we were not VAT registered. “We have received ITF263 documents throughout our history and in each years’ application have stated that we are not VAT registered because of our educational status. This has never been an issue despite ZIMRA knowing our turnover which was above the VAT threshold from 2009 because of educational programmes,” reads the letter. Mr Chris Craig concedes that Far and Wide is not registered with the Ministry of Primary and Secondary Education as an educational facility. “The reason for non VAT registration is because we are an education facility, however the VAT act states that this is true as long as you are registered with the Ministry of Education which we were not (this was only brought to our attention by ZIMRA as we had always thought that our registration with National Parks and The Local Government was sufficient to prove that we were an education facility). “ZIMRA confronted us on this issue. As a result we went to the Ministry of eduction to regularise our registration with them and asked them if they had a facility whereby registration could be back dated and regularised. They said that there was but that there was a late registration fee. “We went through the process of inspection from Ministry of Health and Ministry of Education and then submitted all of our qualification documents which include our University and Postgraduate Degrees in Education. “We subsequently paid to the Ministry of Higher Education all relevant fees including the late registration fee and regularisation fee. We then received our certificates of registration from the Ministry which had now been back dated to 2009,” reads part of the letter. “We do have a tourism side to Far and Wide which has to date earned well below the VAT threshold of $60k per year. However with the opening of the SkyWalk and SkyLine this side of the business has grown and we have since registered a new company under Tourism which will be a VAT registered company. “Our proposal to ZIMRA was for them to accept Far and Wide as an educational facility and for the new company to register for VAT under tourism. All of our tourism products would then fall under this new company and our Education side would remain under Far and Wide. They have rejected this appeal and have said that they are raising this invoice against us,” reads the letter. The letter further notes that; “We feel that we are right and have done everything within the laws of Zimbabwe. We would like to avoid at all costs a costly, emotionally draining, time consuming court case. We are therefore asking for the Office of the President to urgently intervene in this matter. “We are trying to build up the Eastern Highlands as much as possible as it is a beautiful part of Zimbabwe that people need to get to see and in the spirit of nation building and “Zimbabwe is open for Business”. The SkyWalk and SkyLine is our first major attraction that we have brought to the Eastern Highlands, that has already attracted huge numbers of domestic and foreign tourists and is slowly but surely helping tourism and the economy grow in the Eastern Highlands. “The SkyWalk is just one of the many ideas that we have to help build our community. We are currently trying to build the reception and restaurant facility at the SkyWalk before inviting His Excellency President Mnangagwa to officially open the SkyWalk and SkyLine, but find that we are now paralysed by the threat of ZIMRA raising this invoice. Over and above building up the Eastern Highlands for tourists to enjoy we are working hard with local communities to train them and employ them. “Hopefully through the revival of tourism in the Eastern Highlands and our training facilities we will be able to provide people with a lot more jobs once the hotels that have closed down start to reopen. We employ a lot of people already but through our expansion will create more jobs and will look to help the community even more than before.